enter is one of the 1000 most common headwords. (transitive) To enter is to go into something. I entered the building through the side door. (intransitive) To enter is to go in. Please pay the fare before you enter. (transitive) To type something into a computer. I entered all the necessary information but it still won't work. 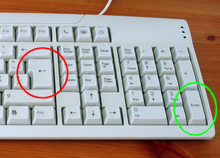 "Enter" is a key on a computer keyboard. This page was last edited on 23 April 2017, at 17:59.